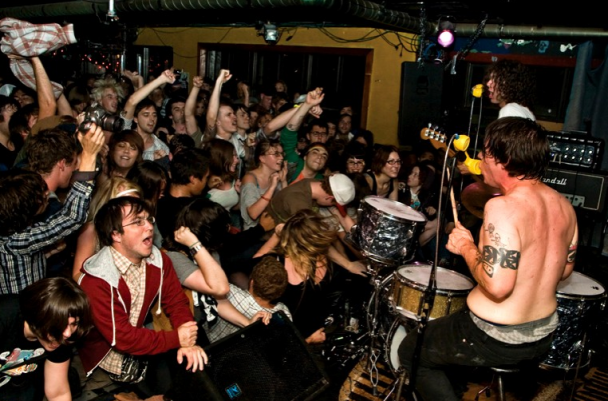 What Is The Sweatiest Party You Attended at Sneaky Dee’s in 2011?! After weeks of off the hook phone calls and friends stopping by the restaurant pleading for a Sneaky Dee’s Signature Hot Sauce Giveaway, we’re excited to officially have a package up for grabs! Starting today, you can enter to win a chance to give that special someone exactly what they’re looking for this holiday season – Sneaky Dee’s Signature Hot Sauce at home! With four delicious flavours to choose from you really cant go wrong and entering is fun/easy so let’s get this party started! I’m getting sweaty just thinking about it! Enter for a chance to win a package of four Sneaky Dee’s Signature Hot Sauces by following the instructions below. There are two ways to enter so pick the one that best suits you! Looking forward to hearing your anecdotes and may the sweatiest party win! *Contest closes on Friday December 16, 2011 at 2pm.